Happy New Year and welcome back to classes everyone! To our returning students, I hope you all had a relaxing two weeks off from classes and for the 115 students who are just starting their time at ACC, we are happy to have you join us. I’d like to briefly introduce the Assiniboine Community College Students’ Association. We are a not-for-profit organization that is made up primarily of full time ACC students, with the help of a team of professional staff. Our goal is to encourage student success by being the voice of students while enhancing the student life experience. This means that we work with and for students to help optimize your experience at ACC through services, events, and advocacy. We have student representatives from all campuses in Brandon and Dauphin. Our two office are located in the Crossroads student space at the Victoria Avenue East campus (room 413), and in the Pineridge Building at Len Evans (room P215). We offer several services to our students such as the Paw Pass discount program, bus passes, clubs, and health and dental coverage. As we all settled in to classes last week, the Students’ Association invited students to take part in our Frost Week events from January 7-11. 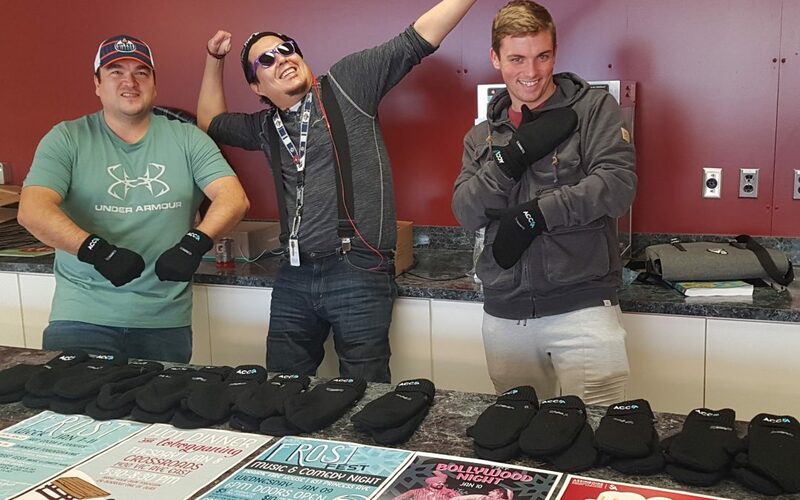 Monday started off with free hot drinks and cookies, served at 11:30 am to 1:30 pm, at all Brandon campuses for a midday pick-me-up during lunch. On Tuesday, we had an evening of tobogganing at the Victoria Avenue East campus. It kicked off at 5:30 pm with a hot dinner and ended at 8:30 pm. The weather turned out much colder than anticipated, so after a few brave runs down the tobogganing hill, the attendees decided to come in and play board games as a group instead! Although the event was a little different than expected, we had a great turn out and a wonderful evening. Wednesday night we hosted Frost Fest at Prairie Firehouse. Doors opened at 6:00 pm and the show began at 7:30 pm. It was a hilarious evening of comedy and live music that finished off with an open mic night. This was our first year holding this type of event, and we hope that it will continue to grow in future years! Thursday night was our second annual Bollywood night, which took place in the Victoria Avenue East campus cafeteria, from 5:00 pm until 10:30 pm. The Double Decker catered a buffet dinner of Indian cuisine, and the rest of the evening was filled with Bollywood style dancing and music. I am happy to announce that we sold out of tickets this year, and we expect continued growth and success when we hold our Bollywood events in the future! To wrap up the week, we hosted a Cheers and Beers event on Friday to cheer on our men’s and women’s futsal teams at their home openers. At 5:30 pm we began selling beers and pizza by the slice, which guests enjoyed in our viewing area in the south hallway by the gym at the Victoria Avenue East campus. Admission was free from students who showed their student ID, and regular admission was $5. For more information on future events, visit our website, Facebook, Instagram, or Twitter pages. Thank you to all those who came to enjoy our events throughout the week!